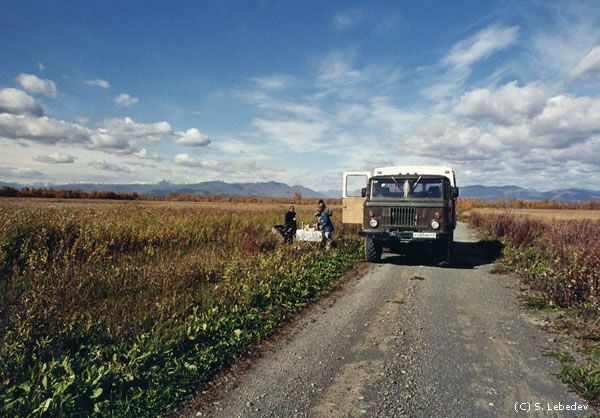 Arrival in Kamchatka in the morning (local time). Bus transfer to Petropavlovsk-Kamchatsky , the capital of Kamchatka (about 1 hour.). Short sightseeing tour of the city. Transfer to Paratunka (a resort village not far from Petropavlovsk, famous for its numerous thermal springs), accommodation at the hotel with thermal pool Virginia or Gelios (double rooms; each hotel has it own thermal pool; facilities are on the floor). Dinner at the restaurant. Free afternoon, rest in the thermal pool. Breakfast at the hotel. 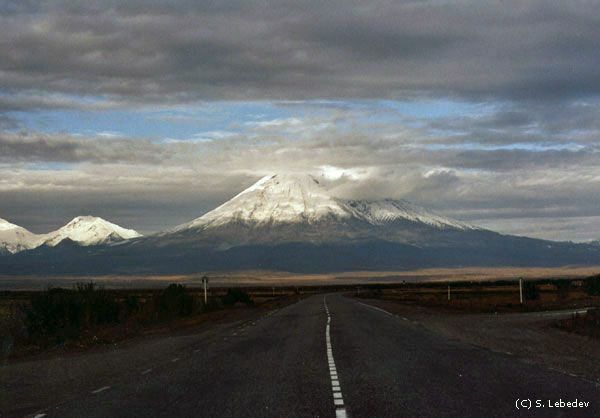 Transfer by 6WD bus to the caldera between the Mutnovsky and Gorely volcanoes (about 4 hrs). The road passes by the Vilyuchinsky volcano, a favorite place for downhill skiing for Kamchatka dwellers (quite often snow lies there even in July). Lunch en route. Dinner, overnight at the base tented camp. Breakfast. Hike (without backpacks) to the Mutnovsky volcano (about 12 hours.). 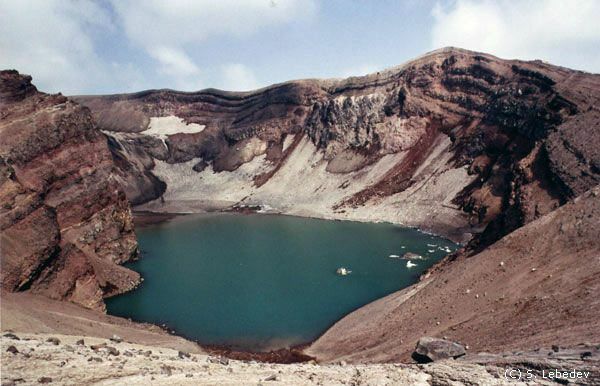 Hike into the crater of the Mutnovsky active volcano through a crack in the volcano's edge. The view is alarming and fantastic: eastward a glacier descends the crater's wall to end in a bluff eaten by fumaroles; opposite it rises a sheer rock, here and there columns of water vapor are curling upward. The appearance of this crater is changeable. 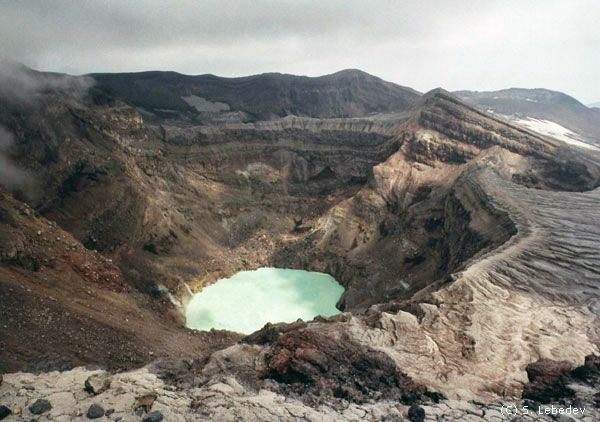 The crater contains a lake of bitter whitish water and two groups of powerful fumaroles. 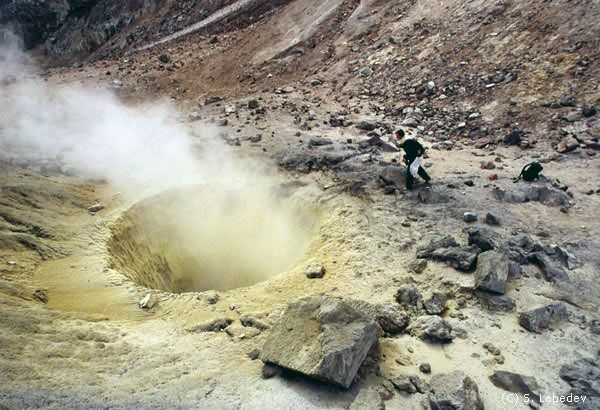 One of the fumaroles throw off small drops of melted sulphur, the other - powerful jets of vapours, water and sulfureous. Near the crater, there are vast mud pits. Mutnovsky active volcano being a nest of merged craters, is perhaps the most beautiful volcanic phenomenon of Kamchatka. The view from its top is magnificent: steep walls surrounding the vast and deep crater cavity, glittering of firm and sparkling glaciers split by cracks, torches of fumaroles oscillating far below and drawing a translucent view over the northern crater, the southern crater under its armour of ice and above all this a column of vapor rising from the Active Funnel crater, surrounded by a cogged crest. Return to the base camp (40 min.). The total distance of hiking during this day is 22 km. Lunch there. Dinner, overnight in tents. Breakfast. 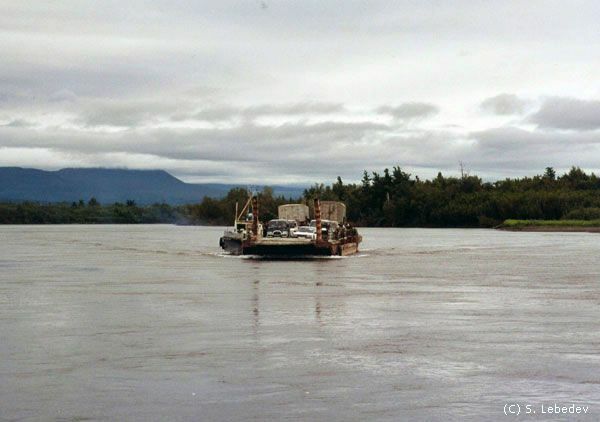 Ascend and hiking excursion to the chain of craters of the Gorely volcano. Gorely volcano presents the unique collection of craters - a chain, which lies across the top. The chain begins with the West crater, no longer active and surrounded by rather low rocky walls. 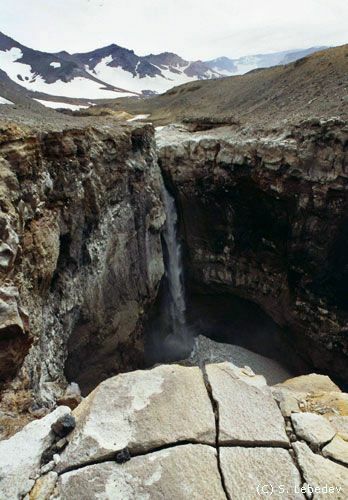 The crater's bottom is occupied by a glacier. Next is the chain composed by craters of different age. Most of volcano's activity is concentrated in the Central crater. 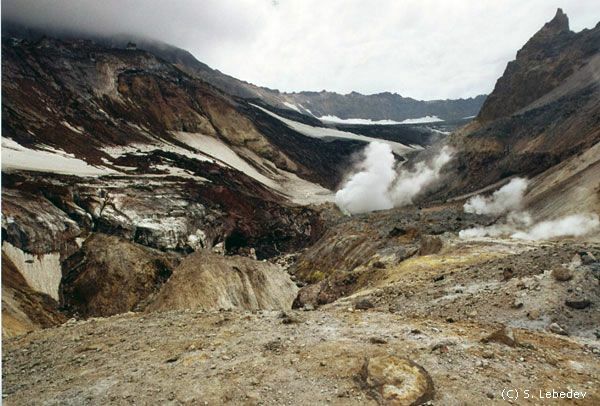 On its walls and bottom, there are permanently active fumaroles; their deposits color the crater's walls. The biggest and the most beautiful crater is the Blue Lake. Its bottom is occupied by a lake of tender-blue water where blocks of ice float. The last in the chain of top craters is the Cup. This crater is on the top of a rather low and perfectly regular cone. On its bottom a shallow lake of violet water is situated. Breakfast at the café. Bus transfer to the area ?f the Tolbachik volcano (more than 500 km, about 10 hrs or more with stops in interesting places). Picnic lunch. Overnight in the tented camp. Transfer by 6WD bus to Petropavlovsk-Kamchatsky. Visit the fish market. Optional (for additional fee) visit to the Museum of local lore, the Museum of the Institute for Volcanology, Salmon Museum, or the museum and visitor center of the Kronotsky Nature Reserve (acquaintance with the especially protected nature areas of Kamchatka – Kronotsky Nature Reserve and South Kamchatka State Nature Sanctuary). Lunch at the café. Transfer to Paratunka, dinner and overnight stay in the hotel. Hiking excursions at the bottom of the Plosky (“Flat”) Tolbachik volcano. The altitude of this area is 1000 m above the sea level. (*In the Soviet time, the testing of the lunar exploring vehicle took place there). Picnic lunch. In the afternoon, hiking to the dormant volcano Krasnaya Sopka (Red Knoll) – 3 hrs, about 5 km. It is quite possible to see hares, reindeer and bears there. Overnight accommodation in the tented camp. Hiking without backpacks to the area where the “Eruption of the Century” (the Big Cleft Tolbachinskiy eruption) took place. It is considered one of the largest basalt eruptions ever known in the volcano belt of the Kuril Isles and Kamchatka. It lasted for one and a half year (July, 1975 – December, 1976) and was included in a list of six the most powerful cleft eruptions ever happened on Earth. 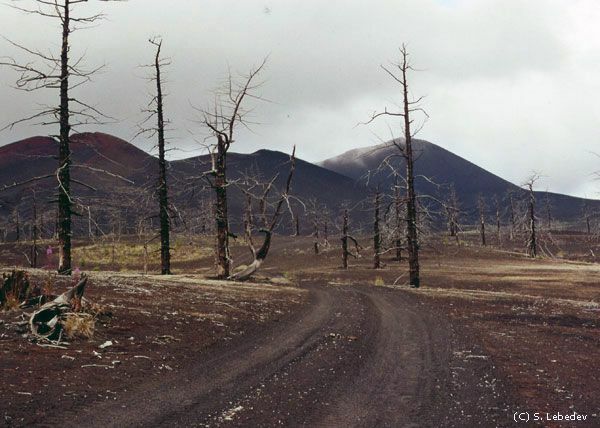 The events were evolving in the mid of a wood 18 km to the south from volcano Plosky Tolbachik. The eruption was accurately forecasted and studied by the scientists of the Institute of Volcanology (P.I.Tokarev). A flaming “candle” reached 2,5 km in height, and the ash cloud was 12 km long. 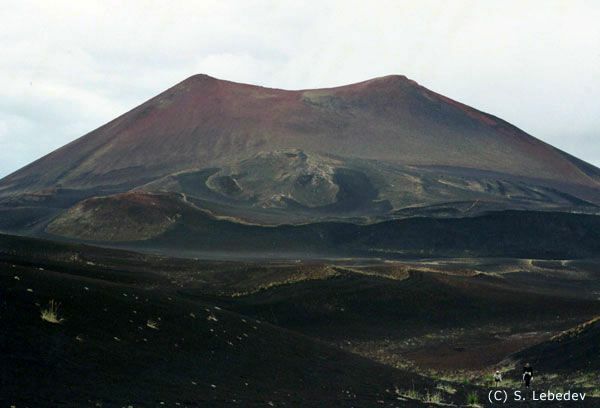 In sequence, new clefts evolved one after another, and as a result four new cones of Tolbachinski volcanoes were formed (from 100 to 330 m high). Eruption turned an enormous territory around volcanoes into a burnt desert, the forests captured by the ash fall dried off to the root. Lakes evaporated and rivers disappeared. Those animals that had survived left the area for the best. Hiking excursion in the Peplovoe (“Ash”) Plateau (8 hrs, about 18 km). A view to this area is nice and unusual: a row of flat volcanoes, numerous clefts, streams of hot gases coming through them. Ascend 3 small volcanoes. 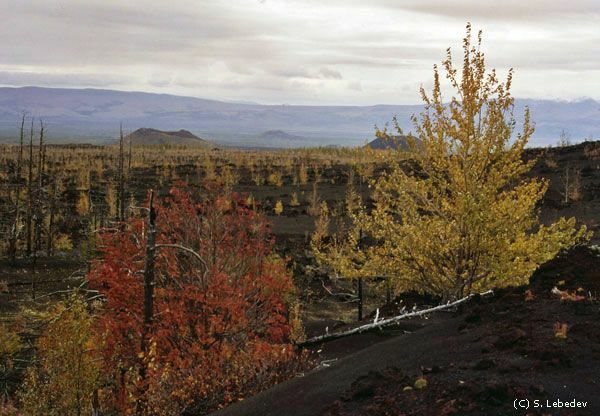 Visit the “Fairytale” forest (ash-buried forest that dried standing during the eruption). Return back to the tented camp, overnight there. Hike to the bottom of the Plosky Tolbachik and ascend this volcano (the total hiking distance is 20 km; this route will take us from 1000 m to 3000 m above the sea level). Ascend to this volcano does not require special technical skills. The whole route will take about 9 hrs. 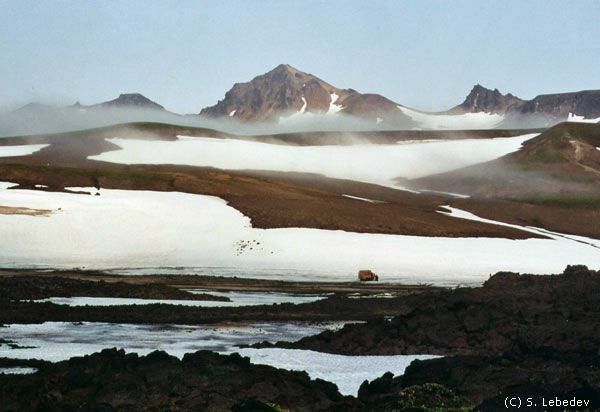 A view to the magnificent volcanoes of the Klyuchevskaya group (laying to the opposite side from the Tolbachik volcano) will open from the upper plateau (if we hike across the plateau). Lunch en route. Return back to the tented camp for dinner and overnight. 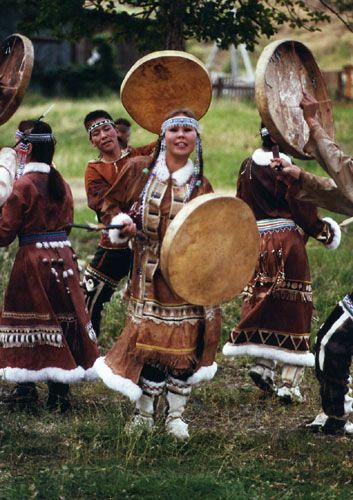 Visit the ethnography museum in Esso. 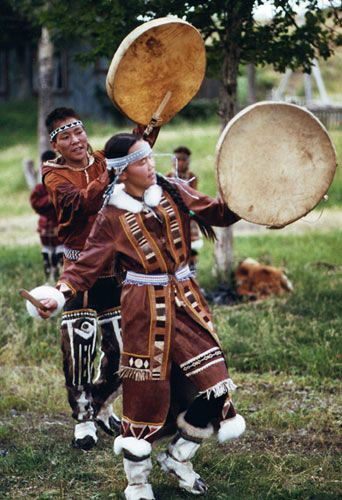 Drive to the village of Anavgai, visit the ethnography complex near-by (there are authentic “chums” - traditional dwellings of indigenous people covered by reindeer skins). Talk to local people living there, taste traditional cuisine and phyto-teas. Performance of the folk ensemble “Nurgeneck” and children folk group “Orjakan”. * For additional payment, visitors can order this day a several-hours horseback riding trip or a helicopter flight to the nomadic camp of the Even reindeer herders). Overnight in the “chum” or private hotel in Esso. Car transfer to the river Essovskaya Bystraya (so-called "47 kilometer"), relax in thermal springs and after that rafting down a very dynamic and picturesque section of Essovskaya Bystraya river. Overnight in the tented camp. Bus transfer back to Paratunka (meant for the whole day). Overnight at the hotel. Transfer by 6WD bus to the bottom of the Avachinsky volcano. Ascend the Avachinsky volcano (its total elevation is 2741 m). Usually tourists start ascending early in the morning. They cross the deep gorge of the Suhaia (“Dry”) river and ascend the volcano along its somma. They stop for a lunch at the attitude of 2000-2200 m and then continue ascending along the new cone of the volcano to the edge of its crater. The ascend usually takes about 6-8 hrs; the steepness of the slope is 30 o . During the ascend and from the edge of the crater, wonderful views open. To the south, the cities of PK and Elizovo can be viewed, as well as the Avacha river valley, Avachinskaya bay, volcanoes Vilyuchinsky, Gorely, Mutnovsky and (if weather is fine) a snow-white cone of the Opala volcano. To the west, a massive cone of the Koriaksky volcano is towering. To the north, an impressive view opens to the Nalychevo river valley, Zhupanovsky and Dzendzur volcanoes. Drive back to Paratunka, dinner and overnight in the hotel. Bus transfer to the airport, departure to Moscow. Arrive in Moscow, transfer to the international airport for the flight home. During hiking trips in the areas of the Mutnovsky, Gorely, Tolbachinsky and Avachinsky volcano, the visitors will not have to carry their luggage, as it will be left in the base camp. They should take only the things necessary for daily hike. Some changes can be made in the program depending on current weather conditions. All visitors should have warm, windproof and waterproof clothes, warm sleeping bags (for the temperature up to 10 Centigrade below zero), sleeping maths, sun glasses. According to the preliminary agreement, it is possible to rent some sleeping bags and maths at place. High rubber boots or jackboots are recommended for hiking across the fields of melting snow in the volcanic areas (during the years when there is still snow in summer time). 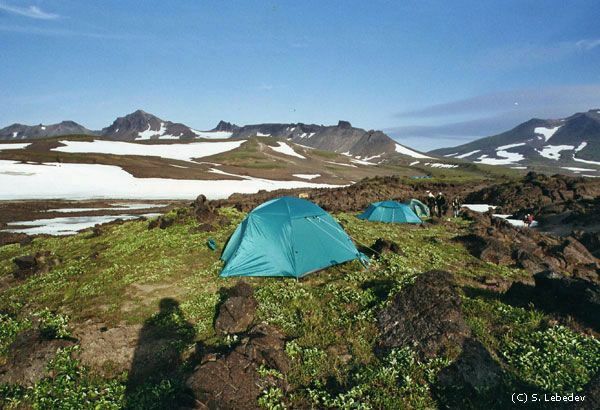 Price includes : full package of services in Kamchatka – accommodation as per itinerary, transportation, meals three times daily, guiding and interpretation services, services of a cook, fees for visiting especially protected nature areas, excursions, museums. Price does not include : visa support, Moscow program, international and domestic airfares, insurance (we provide all above, if necessary), alcohol, items of personal nature.